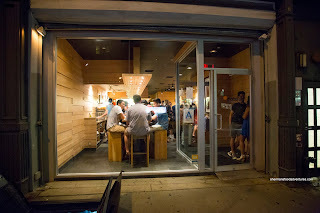 While we were in Toronto, there was a moment where we considered visiting Momofuku. However, we saved that for our visit to the New York City location with Costanza and Elaine. We made our way out to their location in East Village to find out that the wait was over an hour long. Sure, we expected as much, but with a group of 8, it didn't look promising. So we ended up splitting our group into 2 tables of 4. Since we didn't feel like standing around for 1+ hours, we did dessert first at the nearby Veniero's Pastry. Finally seated and after a slice of cheesecake, we started with the Scallop Crudo with ginger, charred corn and crispy chicken skin. This was completely on point and a delight to eat texturally and taste-wise. 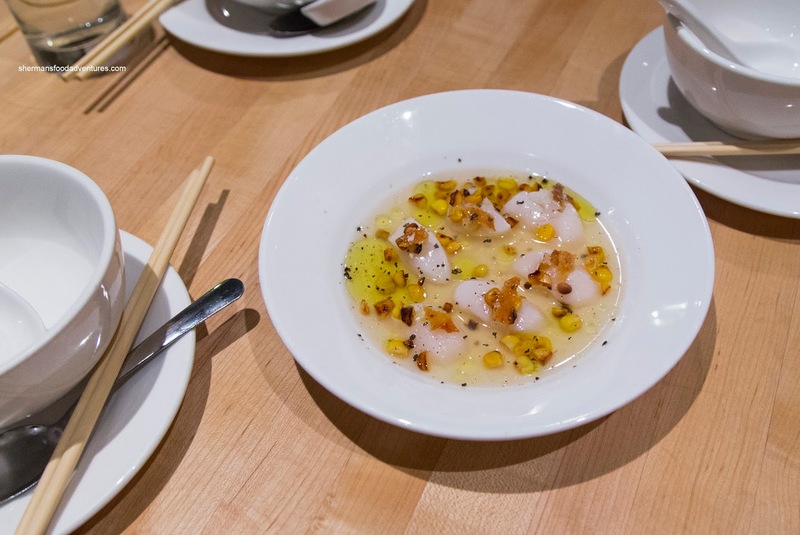 The buttery and sweet scallops were lightly complimented by the smoky sweet corn and background ginger essence along with a light tang. The crunch of the skin was a necessary texture. We also got the Smoked Chicken Wings with pickled chili, garlic and scallion. I found the wings to have unevenly rendered skin, but for the parts that were good, it was on point and flavourful from the glaze. It was a combination of sweet dark soy with a touch of spice and light tanginess. I didn't get much smokiness and I did find the wings a touch mealy. 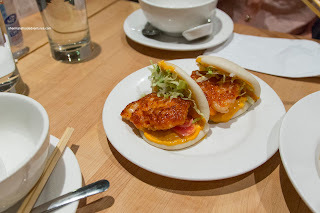 The best thing we had by far were the Shrimp Buns with spicy mayo, pickled red onion and shredded lettuce. We found the bun quality to be excellent being soft and warm with a slight elasticity and chew. Inside, the shrimp patty was absolutely delicious. It was buttery, sweet, cold-water crunchy and well-seared. The spicy mayo provided a creamy kick while the lettuce brought it down a notch. Yummy. Now onto the Momofuku Ramen, we found the noodles to be on point and probably some of the best we've had. They were chewy and al dente with a nice rebound texture. 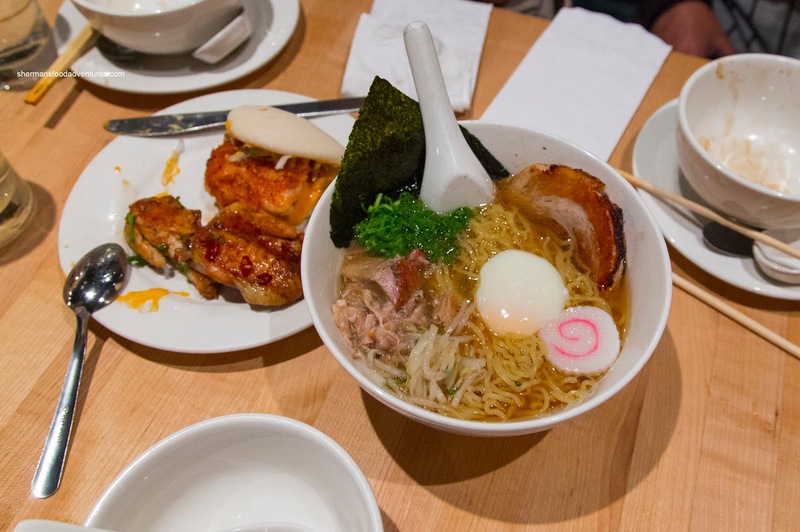 As for the broth, it was indeed flavourful and meaty, but really salty. The pork belly was very lean and smoky from the sear. It wasn't as buttery as expected. Our last dish was the Chilled Spicy Noodles with Szechuan sausage, Thai basil and candied cashews. We were warned that this was a spicy dish and boy was it ever. There was a kick that lasted and lingered, yet at the same time, we could taste the meatiness of the sausage and sweet crunch from the cashews. 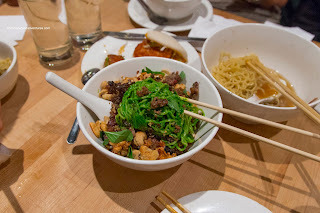 Again, the noodles were on point being appealingly chewy. Overall, we found our visit to Momofuku Noodle Bar to be okay. I guess it was over-hyped in our own minds, so it might've been a bit unfair. 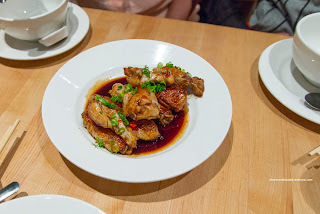 Yet at the same time, we've had better versions of some of the dishes elsewhere.